If you're wanting to start leather working but you're not sure where to begin, the good news is that leather working is one of the easiest trades to get into. 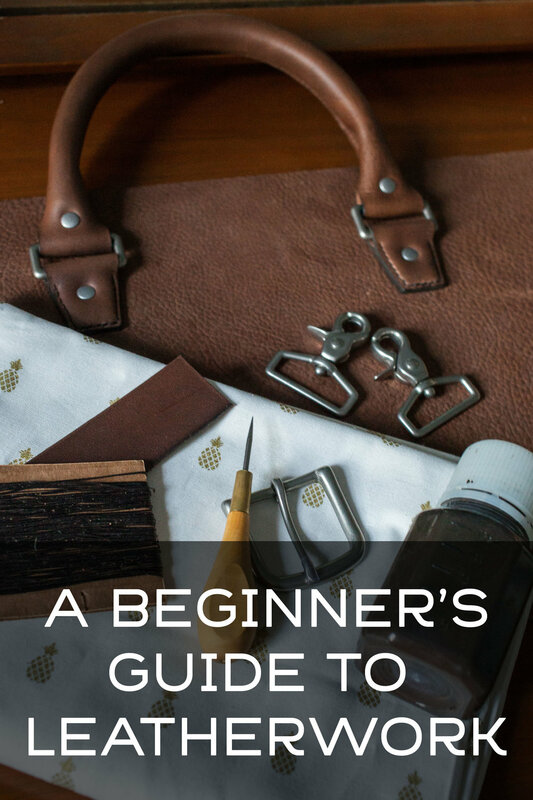 The better news is that in this beginners guide you'll find everything you need to take you from where you are now to successfully completing your first leather project. The best thing to do when you're just beginning is to make something that interests you. Not only does this help keep you passionate about completing the project, it also helps you narrow your focus on a few leather working skills instead of being overwhelmed by them all at once. Pick something that is smaller and simple to make, so you can find out if you like leather working before you make a large investment. If you're having troubling thinking of a project here's a few suggestions: a wallet, a card holder, a watch strap, a journal cover, a bracelet, a sunglasses case, a belt, or a dog collar. There are a number of basic skills in leather working that most projects require, some of these include: saddle stitching, cutting, and edge finishing. Then there are more advanced skills that not all projects need to complete and have more to do with refining a project or larger projects in general. Some of these include: skiving, knife sharpening, and stitching for more unique situations (i.e. box stitch). Try to choose a project that just has these basic skills. An overview on each of the basic skills and tutorials on how to do them are part of this beginners guide. The more advance skills are talked about at the blog. Now that you know what skills are needed to complete a project, you should have a basic understanding of what tools are needed for the project as well. The most basic projects will need the following: a knife, glue, needle and thread, diamond chisels, a hammer, and a ruler. Chances are that whatever you're making will need a few additions to that list. Check out this list of basic leather working tools to know what's at your disposal, and to understand what leather working skills require which tool. There are many different options when it comes to choosing the leather you want to use for your project. Because of the wealth of options, when you’re getting started it’s better to know what to look for than looking at every option available to you. With an understanding of what project you’re going to make, the things you’ll want to look for are: tannage, weight, temper and finish. Once you have a basic grasp on these terms and have made a decision on what kind of leather is good for the project you’re making, you’ll also need to find a good place to purchase the leather from. There’s also a lot of places to buy leather from, but this guide has a list of recommended places. We’d obviously love it if you purchased your tools from us, but I also know you have other options. Just know that we created the Gold Bark Box to help eliminate barriers you might have when starting leather working. Finding the right tools at a good price is one of those barriers. If you decide to buy the box, you’ll get top grain leather, materials, a template and guide for a project of your choice, and time tested tools needed to make your first item. All that’s left is to complete the project, and at this point you should have everything you need to do so. Once you’re done, we should celebrate! Post a picture of what you made on social media and tag @goldbarkleather in it so I can check out what you’ve made.